Creates a PropositionalTriangularDecomposition over the given bounds, which must be 2-dimensional. The underlying mesh will be a conforming Delaunay triangulation. The triangulation will ignore any obstacles, given as a list of polygons. The triangulation will respect the boundaries of any propositional regions of interest, given as a list of polygons. Returns the number of propositions in this propositional decomposition. Returns the World corresponding to a given region. Creates a propositional decomposition wrapped around a given decomposition with a given number of propositions. Clears all memory belonging to this propositional decomposition. Returns the number of regions in this propositional decomposition's underlying decomposition. Returns the volume of a given region. Returns the region of the underlying decomposition that contains a given State. Project a given State to a set of coordinates in R^k, where k is the dimension of this Decomposition. Stores a given region's neighbors into a given vector. Samples a projected coordinate from a given region. Constructor. Creates a Decomposition with a given dimension and a given set of bounds. Accepts as an optional argument a given number of regions. Returns the dimension of this Decomposition. Returns the bounds of this Decomposition. A PropositionalTriangularDecomposition is a triangulation that ignores obstacles and respects propositional regions of interest. 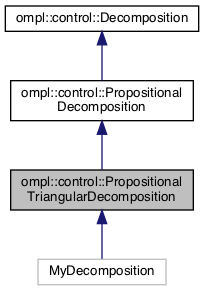 Practically speaking, it is both a TriangularDecomposition and a PropositionalDecomposition, but it is implemented without using multiple inheritance. Definition at line 58 of file PropositionalTriangularDecomposition.h.